A nurse, Hays joined the U.S. Army in 1942, and served in India. After World War II, she worked in Army hospitals stateside, and was deployed again for the Korean War, where she worked in a front-line combat hospital. In April 1951, she was transferred to the surgical ward of Tokyo Army Hospital to evaluate personnel, supplies, and facilities management systems and recommend ways to improve patient care. 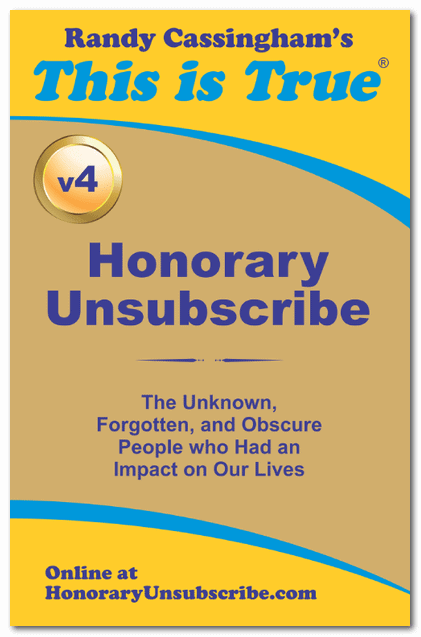 That role evolved into today’s Nursing Methods Analyst. Once stateside again, Hays served as head nurse of the Emergency Room at Walter Reed General Hospital in Washington D.C., where one of her emergency patients was President Dwight D. Eisenhower, when he was hospitalized for 23 days for ileitis. Hays formed a close bond with the President that lasted until his death in 1969. U.S. Army Chief of Staff Gen. William C. Westmoreland and the Army’s Surgeon General, Lt.Gen. Hal B. Jennings Jr., pin general’s stars on Anna Mae Hays. In Vietnam, Hays headed the U.S. Army Nurse Corps. 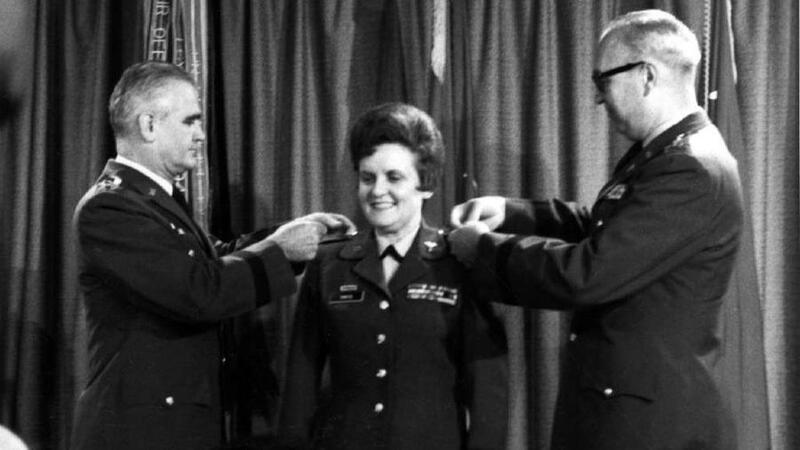 And in 1970, she was the first woman in U.S. military history to be promoted to General. (The second, Gen. Elizabeth Hoisington, Director of the Women’s Army Corps, was promoted at the same ceremony, right after Hays.) After her promotion, Gen. William Westmoreland’s wife, Kitsy, told Hays, “I wish you would get married again.” When Hays asked why, Kitsy responded, “I want some man to learn what it’s like to be married to a general.” Hays retired from the Army in 1971 after 30 years of service. 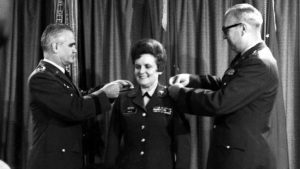 “If I had it to do over again,” she said later, “I would do it longer.” Among her honors, Hays received the Distinguished Service Medal, the military’s highest non-combat award. Gen. Hays died in a nursing home in Washington, D.C., on January 7. She was 97.